You know the excitement you feel when a book you have been waiting for for ages finally lands on your doormat? That almost overwhelming desire to drop everything you are doing and launch yourself into your book, mixed with a tingle of worry in case you end up hating it? That was how it was in my house recently, when BAD SAMARITAN arrived. Except it didn’t disappoint at all. Far from it. This book is every bit as fantastic as Malone’s earlier offerings and leaves you feeling ragged and breathless with emotion at the end. Without giving away any spoilers, DI Ray McBain is back. He is still damaged and haunted by his dealings with Leonard and still wracked with the guilt of knowing he helped to put the wrong man behind bars for the Stigmata killings. His policing skills are still way below par but he is back. And his colleagues are as supportive as ever. The story starts with the body of a university student being found on the street in Glasgow. She has been hit on the head and has plenty of forensic evidence on her but McBain is slow to find the killer and frustrated at his lack of success. Things are made worse for him when he is contacted by Joseph McCall – the young man who willingly took the blame for the Stigmata killings and is currently serving time in Barlinnie Prison. Joseph tells McBain that Leonard is back to his old tricks and that Stigmata will strike again. Needless to say, McBain is now even less happy than he was before and starts to fall apart at the seams. He has a panic attack and eventually gets forced to take time off to get his head sorted. However, being McBain he can’t let things go and gets dragged further and further into his own private cesspool of misery. Knowing that Stigmata is after him, and getting ever closer, he struggles to come to terms with everything that has happened as well as what he must do in order to stop the killings before it is too late. It is not often I read a book that is still with me days after I finish it. I can count on the fingers of one hand the number of times this has happened and BAD SAMARITAN is one of those books. 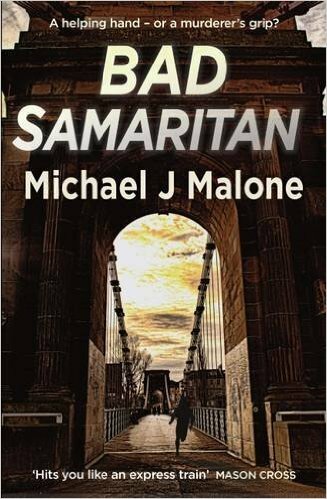 Malone’s writing style is first rate and his ability to transport the reader into the world he has created is beyond compare. If you like books full of characters that are so full of life you feel as if you know them, then Malone’s work is for you. If you like darker crime fiction, with damaged heroes who are doing their best to silence their ghosts and make a positive difference in the world, then you are going to love DI Ray McBain; both in this book and the others he features in. 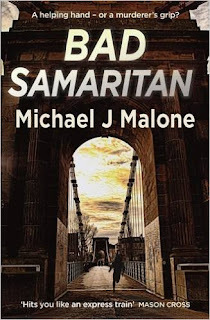 Michael J Malone is a key contributor to the Scottish crime fiction scene. I am impatient to see what he gives us next!